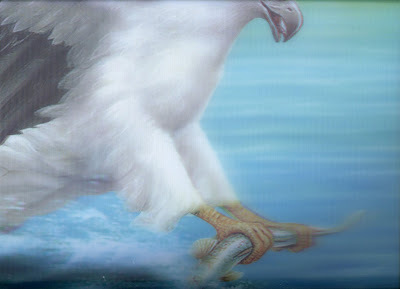 Detail from 3D "painting" of an eagle snatching a fish from the water. Not only does it have the illusion of depth, but also of movement. Space AND time. It's like one of those inspirational posters without the inspirational text, but also feels like a raw primal reminder of the predatory tiers of nature. The work is cheesy yet majestic. If I were to improve on it I'd have the fish staring out at the viewer, its mouth a wide-open 'O' silently screaming from the 3D landscape. Or not. Perhaps it's anonymity is important, a message or something. Its head still under the water taking the final liquid gasp of life.